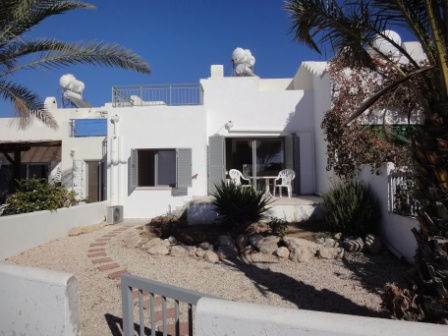 Cyprus Property Blog by Cleo : Back on the Market - Sea Front Garden Villa in Chloraka - New, lower price! Chloraka Village, Paphos - This wonderful sea front villa is located on the coastline between Paphos and Coral Bay, and is within easy walking distance to a range of restaurants and amenities. The property has lots of character, and features a split level living area with kitchen, dining area, and lounge with log fire. Patio doors provide easy access to a raised veranda overlooking the garden, and from here the sea views and sunsets are stunning. From the lounge, steps lead up to a mezanine floor, which can easily be used as a second sitting room/third bedroom/study. Here there is access to a large roof terrace, again with spectacular sea views. From the kitchen a hallway leads to two double size bedrooms with fitted wardrobes, and a family bathroom. There is also a useful storage cupboard under the stairs. The land between the villa and the sea is currently being developed as a local park, so no properties will be built in front to obstruct the views. There is a coastal path nearby which runs all the way to the lighthouse and Kato Paphos habour in the one direction, and towards Coral Bay in the other. Sea front properties in this location rarely come up for sale. The property is in need of a little updating/tlc but has been priced accordingly, and offers a unique opportunity to become the owner of an idyllic holiday home.